Okay, honestly, this could not be easier to make! 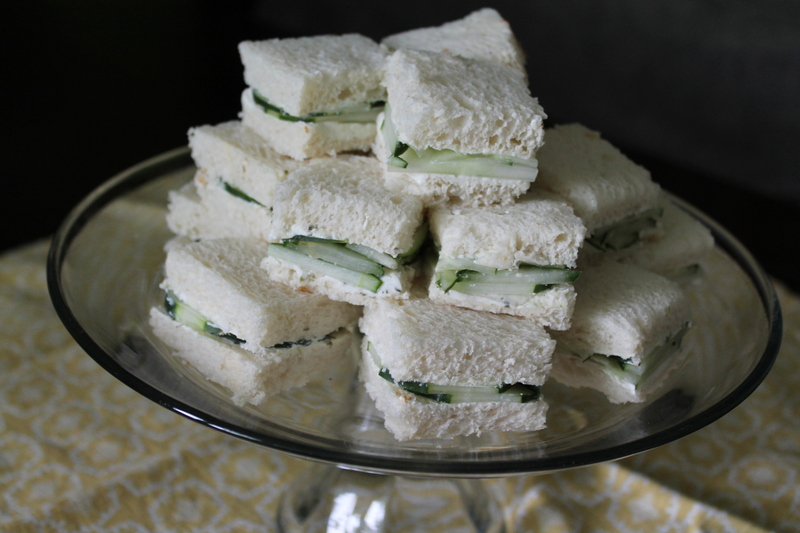 Tea sandwiches are a great addition to, well…tea time… But they are also a good, quick dish to make for picnics and potlucks! Or even lunch (though you might skip cutting them into cute little baby sandwiches if you are just eating one for lunch). Start by very thinly slicing one large cucumber (okay, I did two…because I was so excited about getting rid of the cucumbers). If you have a mandoline, now is a great time to break it out! 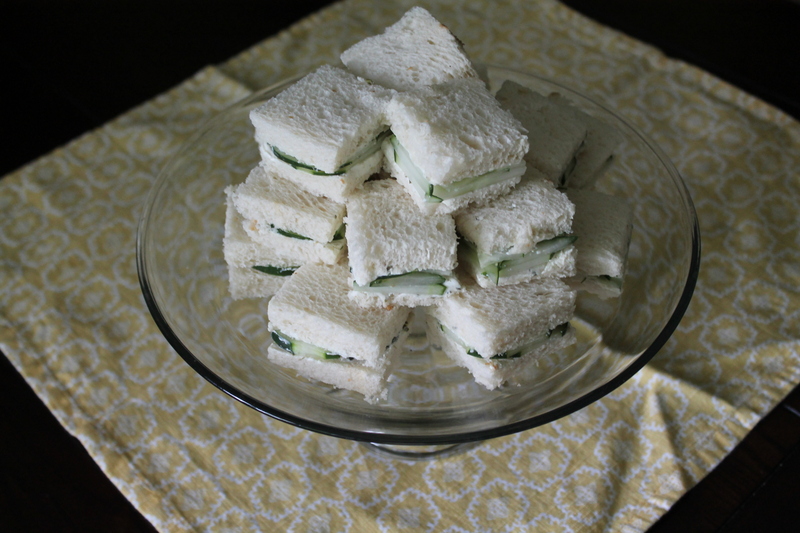 Ideally, all the slices will be quite thin and even…I don’t have a mandoline, which also meant it took about 5 minutes longer to get the cucumber ready. Now all you need to do is very thinly spread cream cheese on each slice of bread. I used white wheat bread, which is somewhat healthier and (I think) tastes better than most white breads, and about 1½–2 tsp. cream cheese per slice. To make this easier on yourself, go ahead and use a flavored cream cheese! I grabbed a tub of chive cream cheese from the grocery store (chive and onion would also have been great) to save time. But if you prefer to go old school, mix about 1 tbsp. chopped chives into ½ cup softened cream cheese. 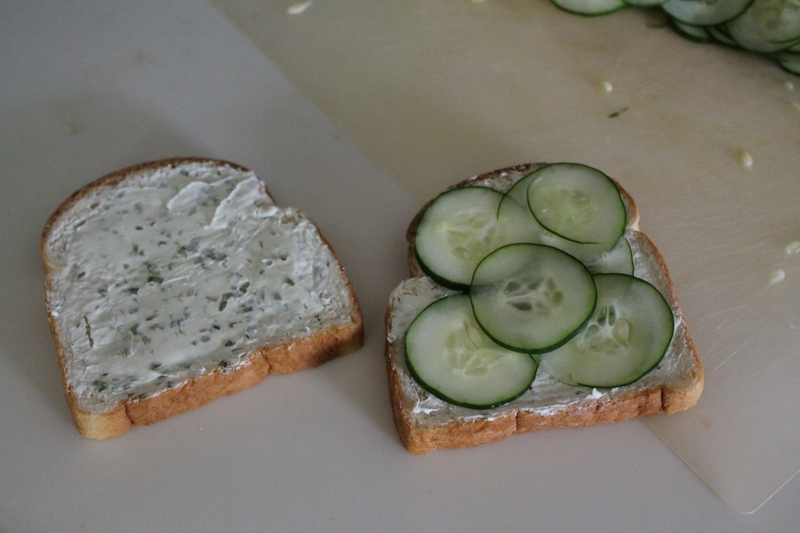 Now layer the cucumbers onto the bread. I put them on about 2 or 3 thick, depending on how fat they were and how easy it was to layer them. So. I hope your bread is more evenly shaped than mine was! Cut off the exterior crusts so that you have a slightly smaller square. Cut that square into four little squares. Be aware that the amounts below might vary somewhat based on how thinly you slice your cucumbers and how thick you spread your cream cheese. Honestly, I am somewhat hesitant to even call this a recipe, because it’s more like a plan than a specific procedure. But here you go! Happy cucumber-eating! 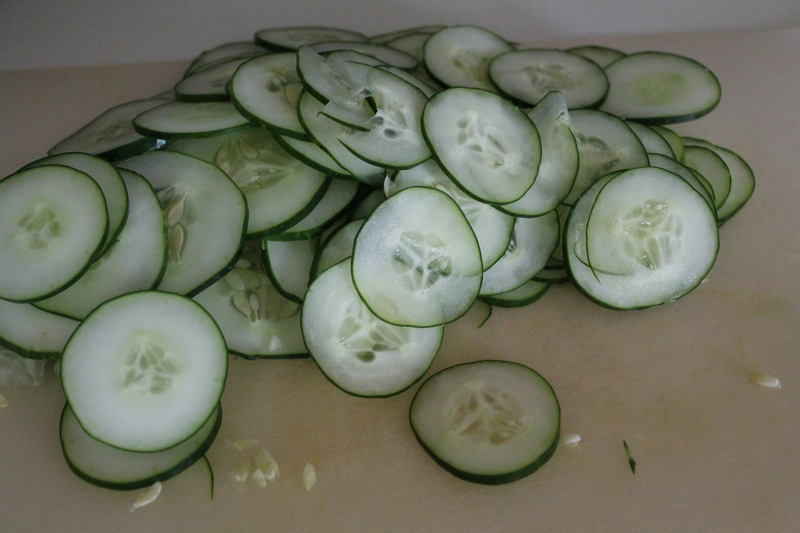 Trim the ends off and very thinly slice the cucumber into rounds. Spread about 2 tsp. cream cheese evenly on each slice of bread. 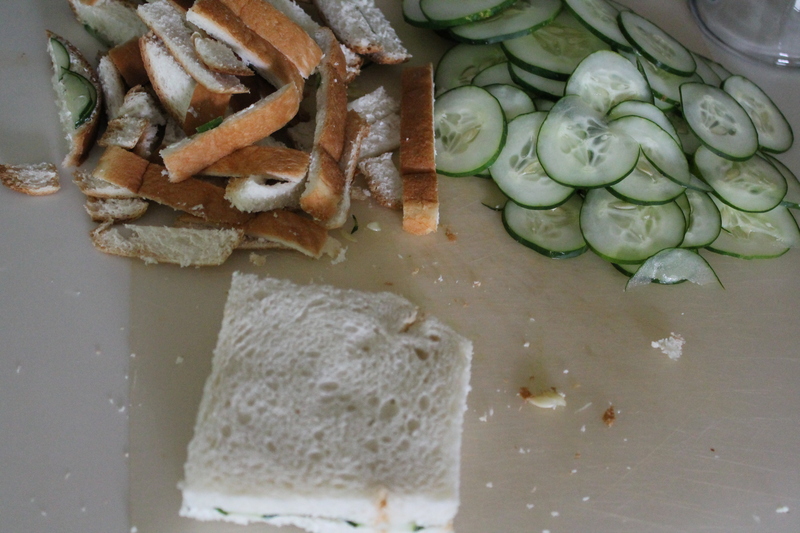 Layer half the bread slices with 8–10 thin cucumber slices. Top with remaining bread. Using a serrated knife, gently slice off the outer crusts of the bread (slice straight across the top, even if this cuts off some of the white bread). Cut the crustless sandwiches into square quarters.